Fizz Festivals partnered with Weston Park to provide Festive Fizz and Eats – a pop up winter festival – as part of Enchanted Weston at the end of last year. Over nine nights in December 2018, Weston Park welcomed more than 7,000 visitors to Enchanted Weston – an illuminated woodland walk around the stunning Temple Woods. Trees, lakes, bridges and even tunnels were lit up in an array of colours creating a magical and enchanting walk. 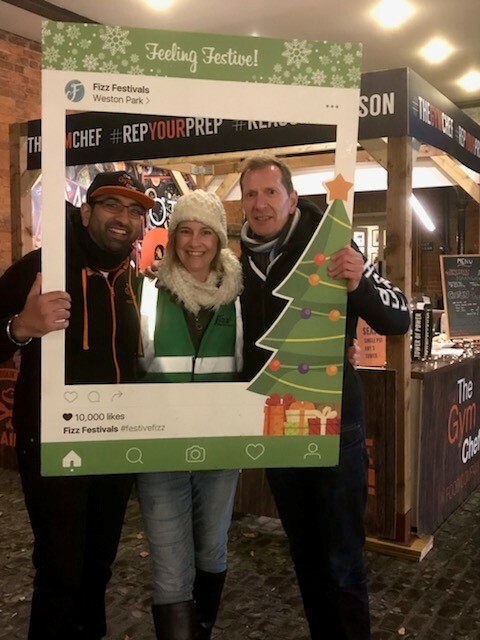 Fizz Festivals created a fabulous pop-up eating and drinking experience for visitors to enjoy after their walk, by transforming Weston Park’s Stable Courtyard into a mini-winter festival. In a cosy stretch tent adorned with twinkling fairy lights, visitors were able to sample a range of delicious street food, indulge in a glass or two of something festive, sip warming hot chocolates and relax with friends whilst enjoying live music. For those that had still not quite finished their Christmas shopping, we also had a delightful array of retail traders in the warmth of the converted stable block, where shoppers could pick up some unique last minute Christmas gifts. But, the real stars of the show, were our two firepits which provided warmth on the chilly nights and a bit of steam on the rainy nights! No fire pit is complete without toasted marshmallows and our traders sold out of their giant marshmallows every single night. Sometimes the oldest traditions really are the best! Festive Fizz & Eats will return again in December 2019, so keep an eye on our website for more details.